Oh the strawberries are getting better and better tasting, am I the only one noticing this? You can tell that the season is getting closer and closer, to the point where we are going to be picking them straight from the gardens and eating them still warm from the summer sun. This salad is from the Life Made Delicious website, as soon as I saw it I knew right away that I was going to make it for lunch that day. I didn’t care that Mike may not like it, the colors made me so happy and the ingredients were simple, healthy and gorgeous. I didn’t use all of the ingredients as we had a chicken breast on the side with this for lunch, but you can also top it with pecans and gouda cheese if you want to add protein. Or, like us, make a simple side of protein and have this large salad on the side. 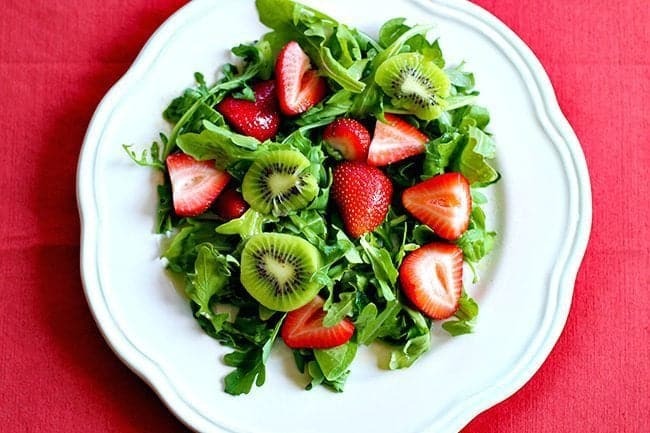 I changed the canola oil in the recipe and used olive oil – I take every opportunity to use olive oil in a fresh dressing- and added arugula since I think it gives a nice peppery bite to the salad. It’s a must have in this salad, don’t skip the arugula unless you have to. Mike surprised the devil out of my and cleaned his entire salad plate. I really didn’t think he would like this at all but I made him try it anyway. I think he surprised himself to be honest, he’s not a fruit in a greens salad kind of guy. The dressing is a mere four ingredients and I can already see that I will be using it as a base for a few other salad recipes I have in mind. It’s a fabulously easy dressing recipe, healthy, sweet and tart all at the same time. I love that it uses honey and not sugar! This is a great work lunch as well, healthy but you tend to forget that it’s good for you when it tastes this good. Thanks for stopping in everyone! PIN THIS RECIPE to your SALAD RECIPES Boards and Remember to FOLLOW ME ON PINTEREST! 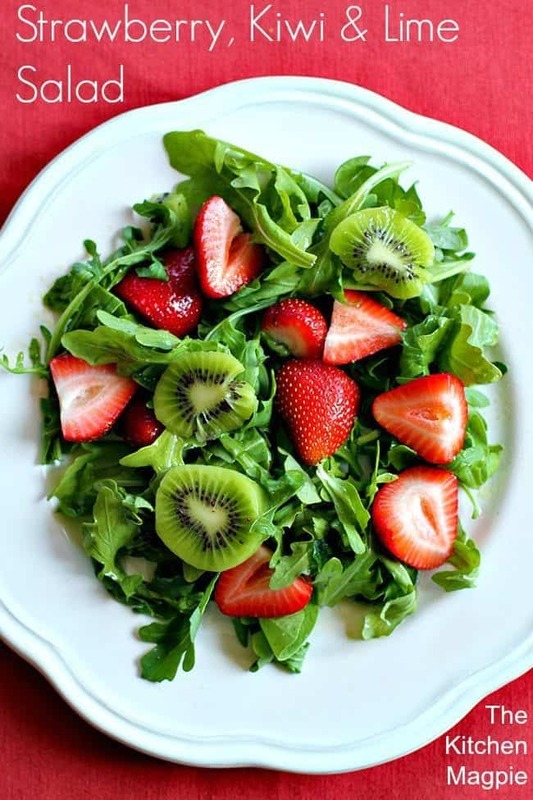 Kiwi, strawberries, spinach and arugula combine to make a sweet, peppery salad with a gorgeous lime dressing. 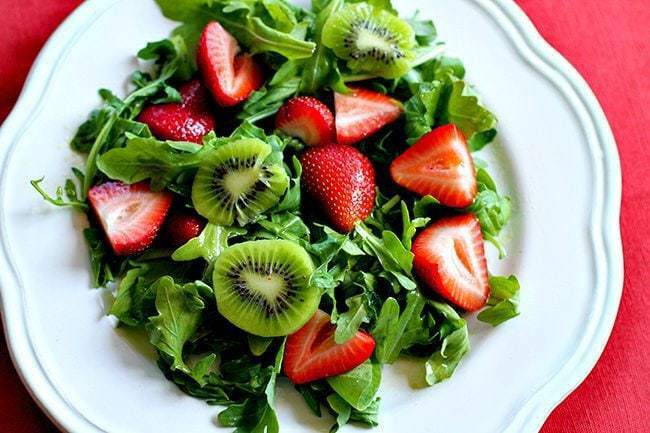 In large bowl, mix spinach, strawberries, kiwifruit. In tightly covered container, shake dressing ingredients until smooth. Pour over salad; toss to mix. Disclosure: I am a part of the Life Made Delicious Blogger Program and I receive special perks as a part of my affiliation with this group. The opinions on this blog are my own. Almost every salad we have in our house has at least one fruit of some kind. We love the combination. That looks wonderful… Although I’m not known for mixing either I’d deffinetly give this a try…. Even the vinaigrette sounds great!